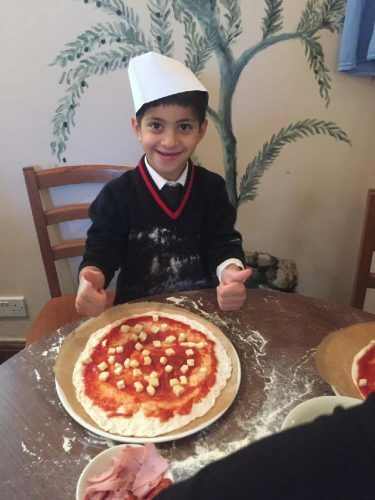 To finish off our science topic of healthy eating and combine it with the design and technology task of researching a commercial kitchen, we visited Dal Nonno Italian restaurant in Crawley Down. Mrs Passmore’s class and half of Mrs Frith’s children went this Wednesday and the rest of Year 2 will visit next week. Harry’s mother, Adriana Anderson, had prepared a wonderful treat. We looked in the kitchen and met the three Italian chefs. They showed us their huge colour coded knives. The blue one is for fish. The chopping boards are also colour coded. 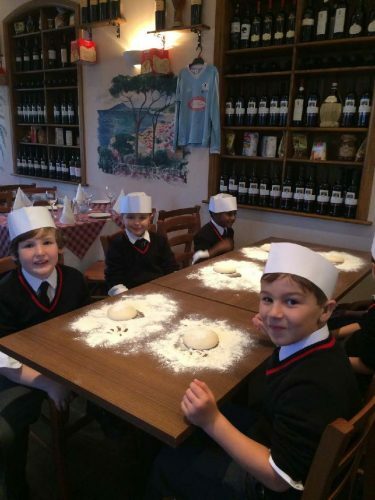 We watched the pizza chef make the day’s bread before starting to stretch our own balls of dough, to make pizzas. We were very skilful and no one had a hole in their dough circle! We added mushrooms and spinach to the tomato and cheese to make them very healthy! We enjoyed a drink while we waited for 5 minutes for our pizzas to cook. We carried a mountain of delicious smelling pizzas back to school to then take home and share with our families. Did they taste as good as they smelt? !